Just hours before Texas inmate Robert Pruett was due to be executed on Tuesday for his fatal stabbing of a prison guard in 1999, a state trial judge granted him a stay of execution. The Texas judge was responding to Pruett’s motion for a post-conviction DNA testing, according to his attorney David Dow. Dow maintains Pruett’s innocence and filed the motion demanding DNA testing of the murder weapon – a metal shank filed to point and wrapped in tape. Dow hopes that advances in forensic technology will reveal another person’s DNA. Update: We've just learned that #RobertPruett was granted a stay of execution. There will be no execution in TX tonight. The fatal stabbing happened when Pruett was trying to take a sack lunch into the prison recreation area, when Texas corrections officer Daniel Nagle stopped him and wrote him up for a disciplinary charge. Nagle was found later that afternoon stabbed eight times with a metal shank. The disciplinary note was also found at the scene. Dow told Reuters that Pruett’s blood and fingerprints were never found on the murder weapon, and that Nagle’s blood was not found on Pruett. His attorney also said his defense was inadequate at trial and evidence was mishandled. Pruett has filed three appeals before the US Supreme Court and had three delays in his execution. Before the fatal stabbing of Nagle, Pruett was serving a 99-year sentence for the 1995 murder of his neighbor. Pruett's execution would have been the seventh in Texas so far this year. 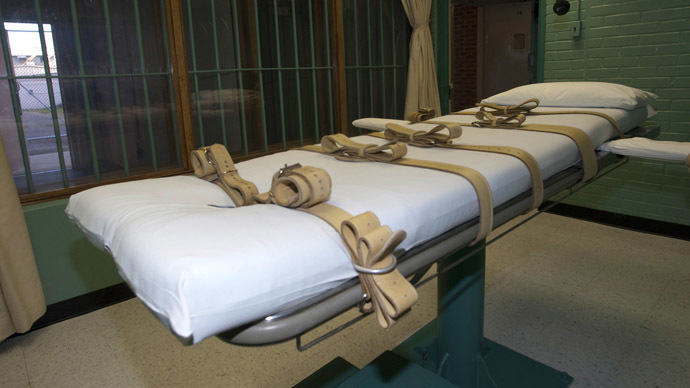 The state has been running low on the necessary drugs for lethal injections, although a Department of Criminal Justice spokesman said there is enough supply for two more executions.